Your body’s building blocks. Protein is a key fixture in the human diet—and we need a fair amount of it too. There’s a misconception that vegetarian, and especially vegan diets are deficient in protein compared to the omnivores. But that’s just not the case. Protein is made up of nine essential amino acids. These acids are essential for good health, however our bodies can’t synthesise them so we must find them in our food. Meat sources of protein and animal products such as dairy and eggs are called complete proteins because they contain all nine essential amino acids. But vegetarians and vegans don’t miss out. To help you hit your plant-based protein goals, we’ve curated a selection of tasty vegetarian and vegan recipes—packed full of nutrients and bursting with flavour. If you’re finding it hard to hit your protein goals, check out Ania’s authentic Greek for a whopping 30g per portion. The straightforward, 6-step recipe is ideal for a lazy breakfast, Sunday brunch or even a pre-prepared lunch. Full the full recipe here. A classic Mexican brunch, Huevos Rancheros was the original fuel for rural Mexican farmers. This combination of chillies, eggs and tomatoes is the perfect ‘pick me up’ filling for a winning breakfast burrito! With a weighty punch of protein, this is a perfect mid-morning recipe to help you recover after an early-morning exercise session. The tomatoes are rich in potassium, which helps your heart and muscles function effectively. While the are eggs packed with vitamins selenium and B12. Try saying Maximilian Oskar Bircher-Benner before breakfast! An early pioneer of food science, Dr. Bircher-Benner believed food wasn’t just there to satisfy hunger, but instead sustenance and health. 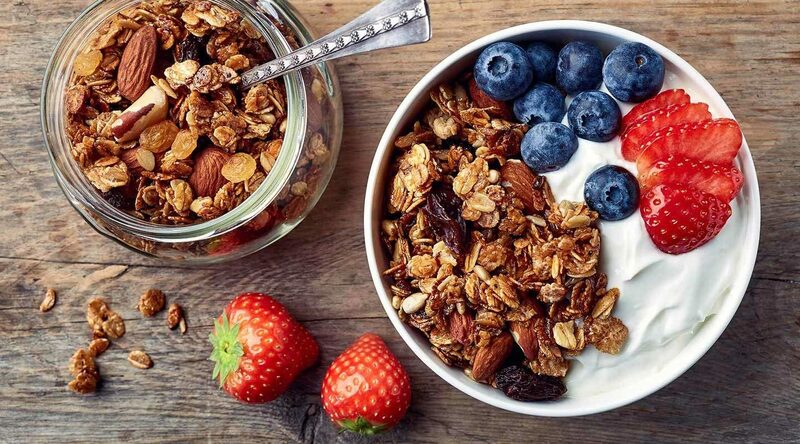 Bircher’s namesake muesli has found its way back into fashion. And with good reason! Overnight, or soaked oats are not only fast and easy to prepare, but you can add your own flavours and toppings, and they’re ready and waiting as soon as you wake. Introduced to the UK from India in the Victorian times, this vegetarian version ditches the fish in favour of chunky vegetables and creamy low-fat Greek yogurt. This recipe provides plenty of protein while keeping the calories a little lower than the original. Greek yogurt is chock-full of casein (around three times more than Greek style). 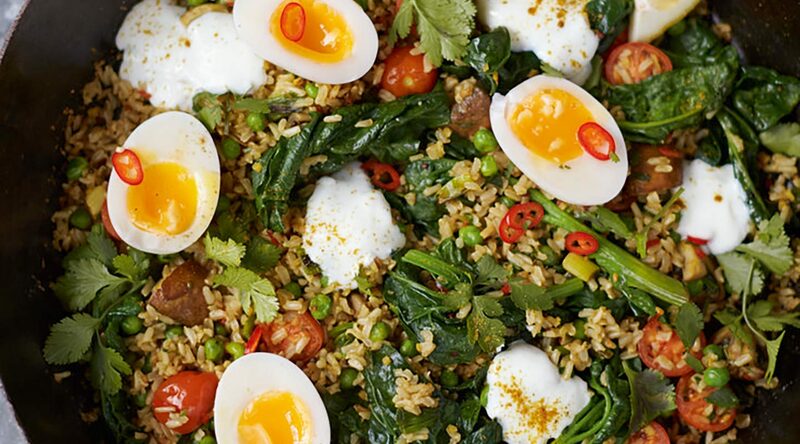 The protein releases slowly, and along with the fibre in brown rice this recipe will keep you feeling fuller for longer, replenish your energy and help you to recover from a hard hitting session. 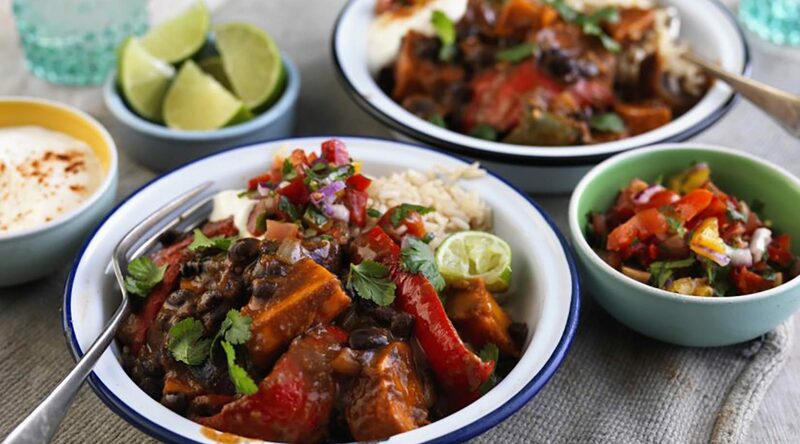 Described as smokey, saucy, flavoursome and FAST, these burritos tick all the nutritional boxes. At less than 450kcal per portion and packing 17g of protein, they’re a perfect brunch to rustle up in under 30 minutes! Sure, you could make your own hummus. 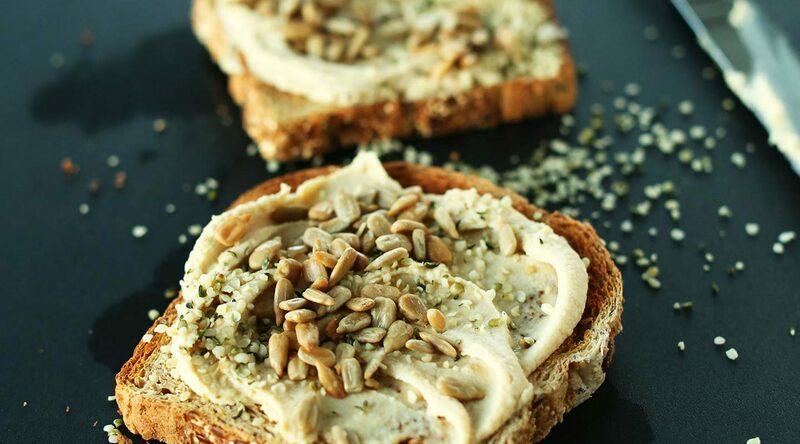 But if you’re pushed for time and in need of a protein hit as you head out of the door in the morning, this super fast, savoury, four ingredient treat is all you’ll need! 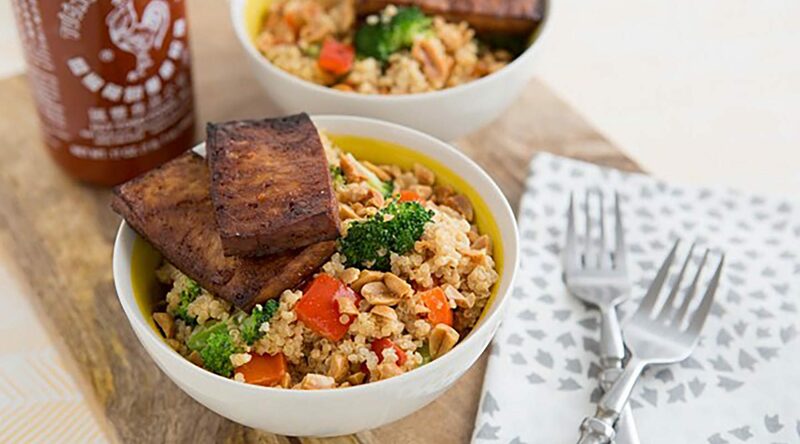 Totalling just 20 minutes to prepare and cook, this Tofu recipe provides a 34g hit of protein! This recipe by vegan advocate and speaker Jolinda Hackett mixes subtle spices of curry powder and turmeric with the silky tofu and scrambled eggs. This spicy, sriracha topped lunchtime pick-me-up is great for all the meal planners out there..
Quinoa—which is actually a seed as opposed to a grain—is full of fibre, much more than most cereals and grains, and a great source of protein. It contains all nine essential amino acids, making it a complete protein and ideal for both vegan and vegetarian diets. 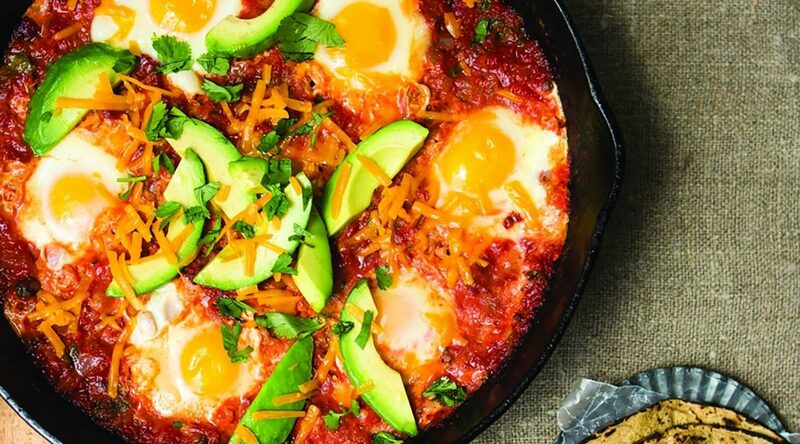 Meaning ‘all mixed up’, this Shakshuka recipe is a fresh take on the traditional tomato dish. This leafy Shakshuka by Clare Knivett, Food Editor of Jamie Magazine, serves up a healthy portion of spinach, rich in iron which helps red blood cells transport oxygen around the body, and is a source of vitamins magnesium and K. These help convert the food we eat into energy, and keep bones healthy. 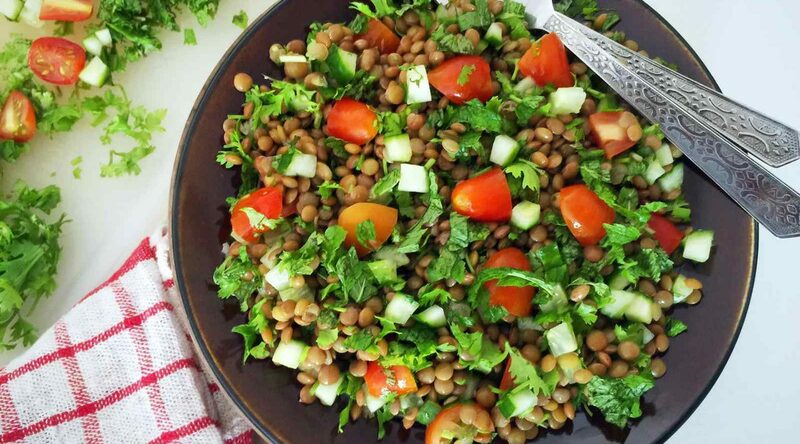 The puy lentils in this recipe are a legume rich in protein and fibre—and low in fat too. Mix all the ingredients together with four tablespoons of light olive oil and the half of the squeezed lemon juice. An absolute classic and staple student lunch. Parred with a slice or two of toast, and packed full of your favourite vegetables, omelettes can cover all the nutritional bases—carbohydrates, fats and protein. While the original can be veggie friendly, this seven ingredient base of silken tofu has takes out the eggs and puts a vegan spin on a fluffy, filling omelette. Sometimes a simple, comforting bowl of soup is all you need. 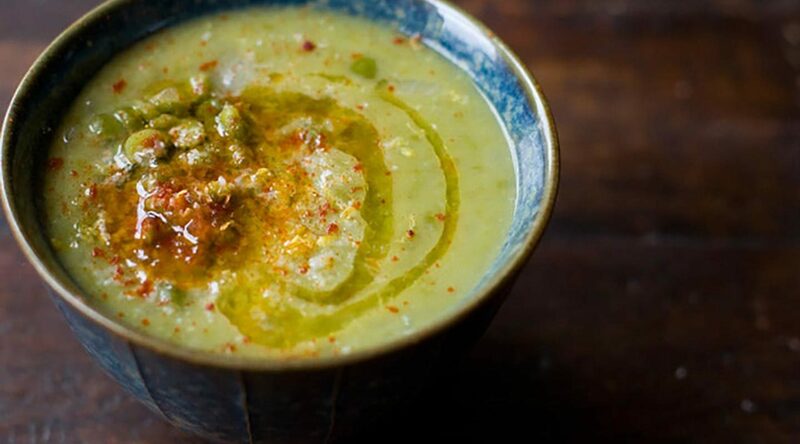 But while soups are usually considered a low calorie, convenient lunch, this split pea soup recipe hits the spot in the protein stakes too. Blogger Melanie Liu, at Jen Reviews, has a healing recipe you can prepare in advance and reheat when hunger hits—convenient for an office lunch! A staple in Brazil, Feijoada is traditional stew of Portuguese origin made with black beans and the cheaper cuts of beef and pork. A healthy, hearty stew packed with heady vegetables and a rich, red wine gravy. This shepherd’s pie recipe from food editor of Epicurious, Melissa Roberts substitutes the mince with Seitan—made from the main protein found in wheat, gluten. Low fat, and at around 75% protein, Seitan is lesser known meat alternative is particularly good in warm, comforting meal like this vegetarian shepherd’s pie. Who doesn’t like tacos at dinner time? These spicy vegan versions use jalapeño chiies and Soyrizo (soy chorizo) to pep-up the warm corn tortillas and refried black beans. An Indonesian soy-based staple source of protein, this recipe takes an Italian twist—meat free meatballs on a bed squash spaghetti in a tomato sauce containing an impressive 20g (or more) of protein per portion! 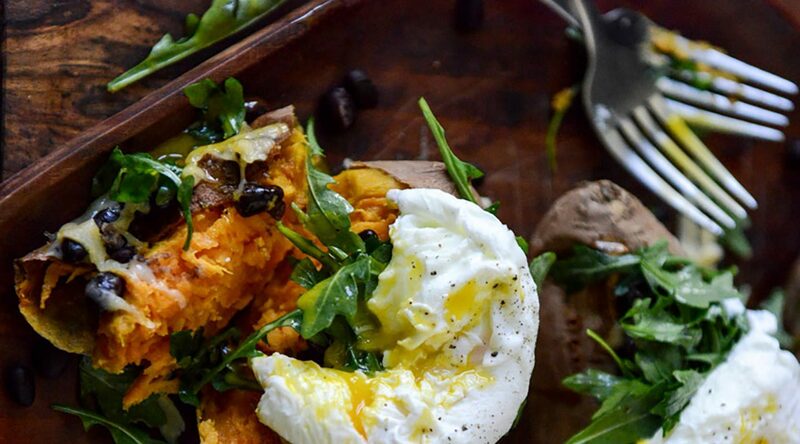 Perfect post-gym, the humble sweet baked potato and poached eggs is a protein packed backup plan for when you’re exhausted and just need flavoursome fuel, with little fuss. The fontina cheese and eggs in this recipe are ‘complete’ proteins, containing all 9 amino acids your body requires to recover properly.